Whether you’re traveling around the United States or visiting another country, there’s a risk of an accident happening and causing you injury or illness. While your health insurance is likely to cover medical transport on a domestic trip, you need travel insurance to cover medical evacuations when you’re outside of the country. There’s also a security risk when traveling to certain countries, so it’s important to have emergency evacuation coverage for travel to dangerous areas. Learn more about trip insurance for medical and security evacuations so that you can decide whether you need one or both types of coverage. 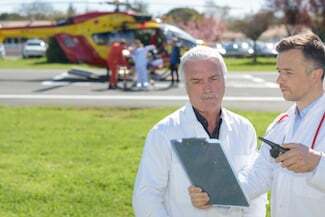 Medical evacuation benefits generally cover the cost of transportation to an appropriately equipped nearby medical facility or a medical facility of your choice if you’re seriously injured or ill. It may also cover medically equipped transport home if you need long-term care. Medical evacuation benefits don’t cover other medical expenses such as physician visits. The trip insurance providers determines the type of evacuation transport based on your location and medical condition. Required services and supplies such as oxygen and special equipment, immigration clearance and coordination procedures are also considered. Each plan has a limit on how much it will pay for the transport as well. In addition to transporting you, many medical evacuation policies will bring a relative or friend to you if you cannot be moved. They may also arrange for dependent children to be taken home or to a location that you choose. Security and political evacuation benefits generally cover your transport from an unsafe place to a safe one. The travel insurance provider will arrange for this transport if you’re in danger during your trip. If your dependents are traveling with you and covered, they will be evacuated as well. When there’s no longer cause for concern, you and your dependents could be returned to your trip destination or returned home. A majority of travel insurance providers offer a few plans that include evacuation coverage for medical, security and political emergencies. Others offer emergency evacuation benefits as upgrades to their trip insurance plans. This is why it’s important to compare benefits and read the terms and conditions of each plan before buying.